Travel , Tourism & Photography | Life is short,have fun!!! Today is a public holiday in #Australia, and in continuation of the Christmas celebrations,we went to #Brisbane to feed our eyes and eventually had dinner. Wifey wanted seafood and i was craving meat (steak, lamb) in fact, any grilled meat will do. No diet this week, that will resume in January. We have eaten at George’s Paragon seafood restaurant before and our experience there was awesome , so it came naturally on our radar when we decided to have dinner. We didn’t have a reservation, but the duty manager or staff in charge of bookings, Casandra was quite helpful as she sorted that out and gave us a vacant table quickly. She is an angel. One quick tip for you , if you are seated in the restaurant between 5:30pm and 6:30pm, it is half rice, yes, you read that right, HALF PRICE !!!. I discovered that today too. We all opted for mocktails since we didn’t want alcohol, this drink was the bomb. Sweet, cold, fresh and quite fruity. There are lots of options on the menu for seafood and meat, but I settled for the ‘Souvlaki’ which is the name for their grilled lamb dish. The meat came out tender, fresh, yummy, properly cooked and awesome. I enjoyed every bite and would have ordered for more if not that i am conscious of my weight. Souvlaki – Lamb, oregano, garlic, onion, capsicum, lemon, olive oil, served on rice with pita bread and Greek salad. I gave the food a score of 8 out of 10 and will recommend the restaurant to anyone looking for an excellent place to dine while in Brisbane. We were attended to by a waitress named , Kelly (in training) and she did an excellent job making sure our food came out on time , we never ran short of cold water and was quite courteous and friendly. Reservations quite essential to avoid disappointments. In continuation of my tour of the city of Brisbane posing as a tourist, i got some awesome pictures for you all. Fortitude Valley is the fun precinct of Brisbane, this is home to China town, famous clubs & pubs, Asian/Oriental restaurants, luxury car showrooms, residential and commercial apartments. This is the fun headquarters of Brisbane city on weekends, i mean it rocks here. Feed your eyes and i hope these pictures will inspire you to visit Brisbane Australia in the nearest future. Best Salmon In Town #Brisbane, Australia. While taking a tour of Brisbane city (Australia) , I stumbled on a farmer’s market that occurs every Wednesday at the Brisbane city square right in front of the city library . There is a variety of fresh farm produce on display and available for sale. Most are sold directly by the farmers or their staff. While walking through the various stalls, I came across a stall operated by a very hard working woman. She was the one handling the wood grilled Salmon, packing and selling them . I was impressed by her strength and service so I decided to buy one of Salmon , wow my first bite took me off my feet, by the time I finished eating the slice I bought, I was in the cloud. Every bit of the fish tasted nice and the effect of the wood grill on the fish was second to none. It served as my lunch. 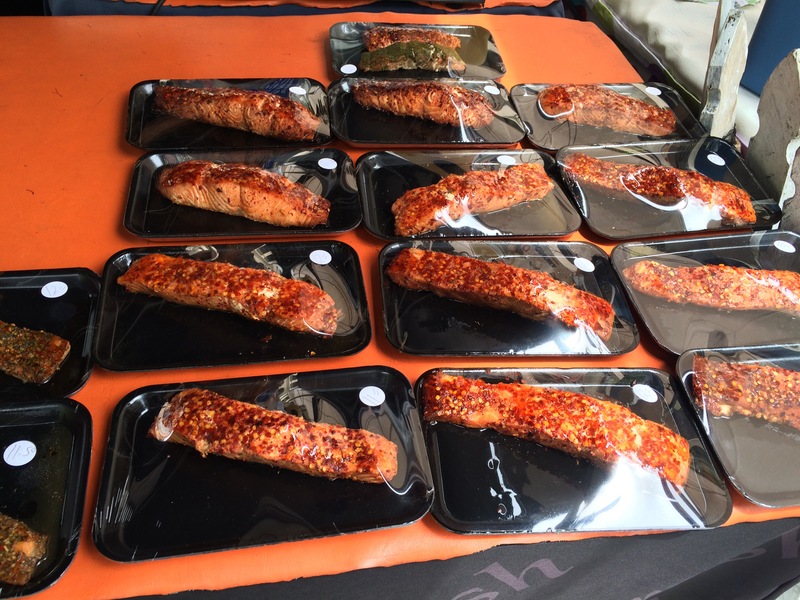 When next you are in Brisbane CBD on a Wednesday, please make sure you lookout for wood-fired Salmon stand to get the best Salmon in town at the Jan Powers Farmers Market.